Dr. Greg Anderson (centre), Dean of JIBC's Office of Applied Research & Graduate Studies, and Chair of the BC Applied Research and Innovation Network (BCAIRN) accepts the Director's Award for Inter-Institutional Collaboration from the Canadian Association of Research Administrators with BCAIRN executive members Margaret Heldman, Dean, Faculty of Science, Langara College (left); and Dr. Neil Coburn, Vice-President Education and Students, Selkirk College. 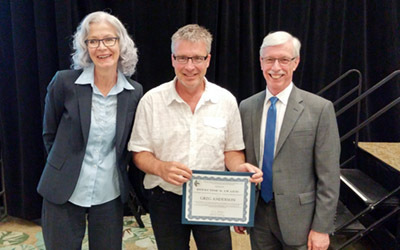 The Canadian Association of Research Administrators (CARA) has awarded the BC Applied Research and Innovation Network (BCARIN) the Director’s Award for Inter-Institutional Collaboration at it’s 2016 annual conference in Vancouver. This award is presented to the BCARIN for demonstrated leadership and creativity in working collaboratively and effectively to achieve a shared goal in the development of templates and policies, and by addressing barriers to success at an individual, institutional or provincial level. BCARIN is a collaborative and cross-disciplinary organisation of BC colleges, institutes and teaching universities. It is dedicated to establishing and developing a culture of and capacity for applied research and social innovation to support the ongoing educational, economic and social develop of our learners and communities. Dr. Greg Anderson (BCARIN Chair) accepted the award on behalf of the organization. Joining him were Margaret Heldman (BCARIN Past Chair) and Neil Coburn (BCARIN VP Liaison).